I am not sure how I found out about Thundermother, I am pretty sure this is a band that I found out about while flipping thru videos on Youtube and the video for their song “Its Just A Tease” popped up. Great song by an all female rock band. I was hooked at that point and soaked up all the tunes I could find on Youtube that evening. 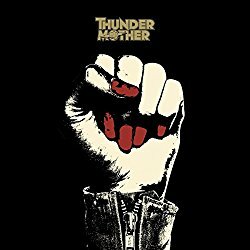 Thundermother’s first album “Rock n Roll Disaster” was a solid debut album, where you can definitely hear the AC/DC influence in the music and the voice of Clare Cunningham is showcased beautifully between the twin guitars of Giorgia Carteri and Filippa Nässil. Tilda Stenqvist pounding the skins with Linda Ström on bass put a groove into this that really kept my foot tapping. A year later the follow up to “Rock and Roll Disaster” was released, “Road Fever” kept their motor revving. Another album to be proud of, this has the same hard rocking feel that “Rock and Roll Disaster” had, but a definite evolution to their playing and sound. This album never slowed down. Unfortunately, Thundermother did slow down. March of 2017 brought what a lot of people thought would be the end of this band, with everyone leaving the band except for founder and guitarist Filippa Nässil. I know I was disappointed. Thundermother is experiencing a rebirth, with the upcoming release of their new album, “Thundermother” and I got to hear the new line up of Guernica Mancini on vocals, Filippa Nässil on guitars, Sara Pettersson on bass and Emlee Johansson on drums, before it hits the streets. I am filled with trepidation. Clare had an amazing voice and they have dropped down to one guitarist. How different is this going to sound? Are they still going to sound like the Thundermother of the past 2 albums. So I have spent the afternoon blasting all three albums in my house and here is what I think. I had nothing to worry about. “Revival” is the track that leads off this album and it definitely sets the stage for the album, if not the band. Guernica’s voice is perfect on this AC/DC inspired track. “Whatever” is a straight to the balls rocker and my doubts about a single guitar player are put to rest. Filippa’s playing is definitely the kick to the balls. “Survival Song” starts off a bit slower than the first couple of tracks, but gives a bit more of a spotlight on Guernicas voice, then it builds up into toe tapper. “Racing on Main Street” reminds me of just that, slow cruise along the drive then hitting the gas and smoking the wheels as the chorus comes along. “Fire in the Rain” this track is definitely a change for Thundermother. A nice slow song, that hooks you in with the chorus. Reminiscent of the power ballads of the 80’s, maybe this is why I like this song. “Hanging at my Door” Another song that is a bit different, can’t quit put my finger on it. I like it though. “Rip Your Heart Out” Gotta love a song where the first thing that really smacks your face is the drums. Between Emlee’s drums and Sara’s bass, my hands were pounding my desk throughout this song. Did I mention it has a nice guitar solo to? “The Original Sin” another solid rocker, that doesn’t slow down at all throughout the whole song and another one that got turned up louder when it started. “Quitter” Another song that just jumps right in and head bangs until the end. I am loving the sound of Guernicas voice on this song. “We Fight For Rock N Roll” This was the first single released by the new line up, good tune and my first taste of Guernicas vocals and stage presence. Good song that has a lot of AC/DC influence in it. This is another one my wife is yelling at me to turn down. “Follow Your Heart” Starts off slow with a definite feel of the 70s in it. The longest song on this 13 track album, it starts picking up tempo just over 3 minutes into it, and Guernica sounds a lot more relaxed singing this one. One of my favorites on this album. “Children on the Rampage” Another song where the drums and bass are what I am hearing stick out, I know I am strange. This is another song that is sticking out for me, good vocals, good guitar and solid drums and bass. I actually like the message in the lyrics. “Wont Back Down” This is the last track on the album, definite blues feel to this one. Overall, this is a great album, definitely a different sound from their first two albums. I feel this is an evolution of what they had started with the first two albums. As much as I loved what they had then, This album stands on its own.